Experience Frankfurt am Main. This varied and lively Main metropolis extends a hearty welcome. With our Limousine - Sedan Service Frankfurt, you don´t need to know your way around. Our well-trained chauffeurs will take you quickly and comfortably to your desired destination, whether you are travelling on your own or in company. 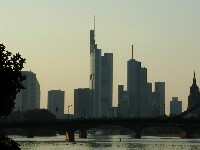 Set in both the heart of Europe and Germany, Frankfurt is an important transport hub. You can fly to almost 300 destinations worldwide from Europe´s second biggest airport. Searching for a parking place is a thing of the past. Whether you want to be picked up in comfort from the airport or from a Frankfurt hotel and quickly be taken to your flight, our Limousine Service Frankfurt is at your disposal round the clock. This financial and exhibition city has the world´s biggest trade fair company. Approximately 120 exhibitions a year are the venue for over 65,000 exhibitors and more than 3 million visitors. Whether Lifestyle or Automobile Exhibitions, all the important international trade fairs are held here. Why not invite your business friends or partners to a unique sightseeing tour of Frankfurt. Or take advantage of our bring and collect service from your hotel to the exhibition centre. With our Limousine Service Frankfurt, you can conveniently combine mobility and luxurious service. And after a hard day´s work, there´s nothing like enjoying a well-earned break and having a good time. This cultural city has a wide range of events on offer. Are you keen on opera or are you a lover of the arts? And what about a visit to the Museums Festival on the banks of the River Main or the Skyscraper Festival? In Frankfurt there´s always something happening and something to celebrate. Come and join in the celebrations. You can enjoy an „Äppelwoi“, Frankfurt´s national drink, or have a glass of wine from the municipal vineyards, without the need to worry. Our Sedan Service Frankfurt´s drivers are always on call and will bring you back home safely. You are an event organiser? Then you can profit from our many years´experience in managing big events. Collecting guests, providing impressive vehicles and chauffeurs who speak their guests´native language - we take care of all the essential details. And while you´re there, then perhaps it´s also worth visiting the surrounding countryside around Frankfurt. Wiesbaden and Mainz are a stone´s throw away. Here, too, there´s a lot to discover and enjoy. And for nature lovers, Taunus and Rheingau are right on your doorstep enticing you with attractive options and possibilities. 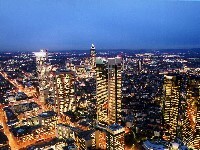 The Limousine Service Frankfurt will take you there.